To those who intentionally breed nice things for the AP: I think today is the last day to do that before everything will get covered under Valentine eggs. With the current AP time, most things bred on the 6th and everything bred on the 7th is likely to die behind the holiday wall. The 2017 Valentine wall ended on February 17 around 6 pm Cave Time. The 2018 Valentine wall ended on February 18 around 7 am Cave Time. I estimate the best time to resume AP breeding would be the 14th or 15th (in order to make low-time eggs that are still influenceable). Just sent two puppies to the AP. They aren't fantastic, but they'll be a fun catch, I think! 171 eggs from black sweetling lines were just bred for the ap. Would appreciate an Aether massbreed sometime over the next week, thanks! Bred my Aethers & Whites! I second the Aether wall, especially since mine did so poorly. Mostly no eggs, 1 Freckled, 1 Siyat & 1 Aether. Maybe that's good? Got quite a few Whites, though, so hope that helps. This Heartseeker wall is... long. Wow. That Heartseeker wall is rude and uncalled for. Many people breed special Valentine dragon pairs that we can only breed once a year. At some point it will revert to regular eggs again and many of those special pairings will be lost. I released a Valentine hatchling yesterday, not realizing at the time there was a wall. I guess it will grow up wild. I can understand a small "wall" that lasts for maybe an hour, but long walls like this, especially during a limited holiday event, are a selfish act. 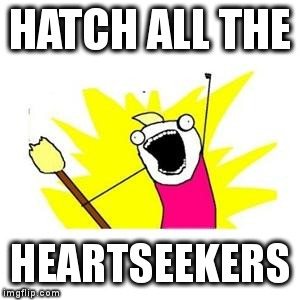 Also they just randomly grabbed every Heartseeker on their scroll and randomly bred them. My ad blockers are now turned on in protest. TJ, I hope you will do something about these extended walls. There should be a limit ... one person should not be allowed to affect everyone's game like for more than a day. Is there a topic in suggestions to discuss this issue? I know that some like the walls, but we all have the right to be heard. How do you know they are all from the same person? And other stuff gets grabbed fast--it's not actually a solid wall, it's just that that is the breed everyone is least interested in. Don't hatchlings go directly to the AP? I've seen some--I don't think the hatchling you released will be lost. When it is a wall of this length, you can almost guarantee it was an organized effort. It doesn't really matter whether it is one person or a group. Mass breeding a wall of this length during a limited holiday IS rude and uncalled for. Sure, when there is a wall in progress, "other stuff gets grabbed fast." But during a normal Valentine AP, it is generally a mix of the older Valentine breeds that stay longer in the AP, like Arsani, Heartseeker and Valentine '09. It usually isn't a solid wall. In a normal Valentine AP, Heartseekers get picked up faster than some other older breeds. But not when the Heartseekers are mostly super messy. Unless one likes that sort of thing. You seem to be implying with your "other stuff gets grabbed fast" comment that this wasn't a planned wall. I believe it was a planned wall due to its length and the consistency of the one breed. This doesn't even look like randomly bred. This looks like Heartseeker checkers deliberately bred to stuff that DEFINITELY doesn't match the Heartseeker's lineage. It's a Heartseeker troll wall. Ah--ok. I'll take your word for it! I managed to snag a pretty one from inside the wall... but it took so long. It does feel really deliberate, and it's a shame as I love Heartseekers but all these are the deliberate kind of messy where it's pretty checkers bred mostly with caveborns. Even the stairs, with a CB common breed and pretty easy to continue properly, have been messed up by using a different CB common for this wall. It feels to me like there's a difference between a 'legit' messy, that's long and weird and maybe up to like 20 gens or something, and then something like that which just feels silly. But other people can breed their dragons how they want. I'm locked now anyway, just hope when I unlock the wall is gone but it's still valentines in there! Huh, I thought it was just someone who really likes Heartseekers and doesn't care about lineages. But trolling would probably be a more likely explanation. Anyway, I'd rather live with the occasional wall of breeds and lineages I don't like than with restrictions on what we can send to the AP. Definitely agree. And I'll add, 'walls I don't like' is a completely subjective thing that is different for everyone. Personally I *hate* it when the AP is completely filled with short 'nice' lineages that are rather boring and not what I'm looking for at all. I hate when all I can find are even-gens (omg I've tossed back sooooo many freaking even-gens this v-day!). Just because some people have posted complaining about this 'seeker wall, that doesn't mean there aren't other people who are *loving* it and having tons of fun picking through it. I understand the sentiment of 'people shouldn't be allowed to block the AP like this' if 'this' is what you aren't interested in, but that doesn't mean no one is. Have actually found some nice heart seekers in there, so there is hope! Been catching and releasing mainly trying to help keep things alive and such. I agree, it was boring. I was hoping they were bred to the messiest, ugliest dragons that would make hot lineages that doesn't fit the lineage counter. This wall has been a beautiful disaster though. I've poked at the wall and most of the pairs look beautiful together as two individual dragons, so I considered that it might be someone who just looked at two dragons, thought they'd look good together, and bred it. Where's the signup? I'd like to participate next year. Clearly there's a place I need to be in to be a part of this beautiful project. I agree, it was boring. I was hoping they were bred to the messiest, ugliest dragons that would make hot lineages that doesn't fit the lineage counter. This wall has been a beautiful disaster though. Where's the signup? I'd like to participate next year. Sorry! It was a joke--there's a movie called Fight Club, and everyone was saying that for ages, hot phrase at the time. I only meant that in saying that you wanted to join (talking about it), you'd broken the first rule. Not a very funny joke--I'm sorry.